23rd February 2018: Today, the new NOW TV Smart Stick is available to buy from some of the UK’s biggest retailers, and will be available from http://www.nowtv.com/smart-tv-stick on Monday 26th February. Available from just £14.99, making it the UK’s cheapest streaming stick, the portable plug-and-play NOW TV Smart Stick is an easy way to get the best pay-TV entertainment, the latest movies and exclusive live sports on your telly. The NOW TV Smart Stick comes with Voice Search so you can quickly get to the TV you love, by simply searching for your favourite show, film, actor or director. With Live Pause on NOW TV’s premium channels, including Sky Sports, FOX, Comedy Central and Sky Atlantic, you don’t need to worry about missing any of the action. From YouTube to Sky Store, there are over 50 apps available to download on the NOW TV Smart Stick. 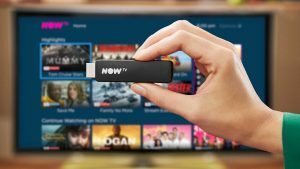 Plus, as of today, NOW TV revealed it will be adding the free UKTV Play app to the NOW TV Smart Stick and its family of streaming devices. UKTV Play hosts shows from UKTV channels Dave, Yesterday, Really and Drama. So, you can now watch multi-award winning boxsets like Taskmaster, get spooked by Most Haunted or indulge your love of custom supercars with Yianni: Supercar Customiser on your NOW TV Box or Smart Stick. The NOW TV Smart Stick also give you access to some of the UKs best catch-up services, including BBC iPlayer, ITV Hub and All 4.